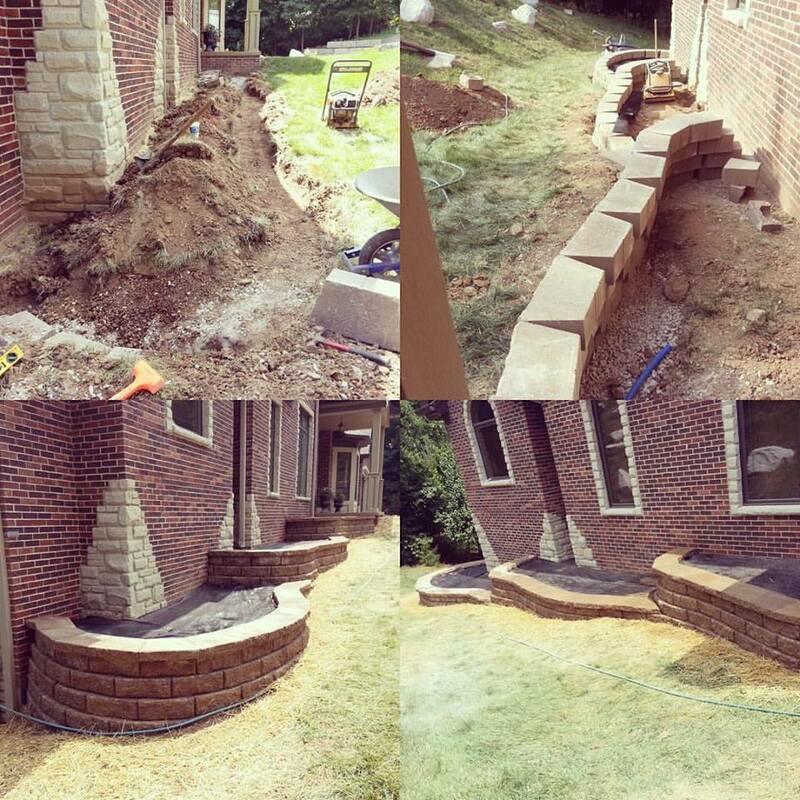 Retaining Wall & Backyard Landscape By Irreco LLC. We specialize in building functional retaining walls. Do you have a sloped property? Are you looking for more definition or separation in your landscape? 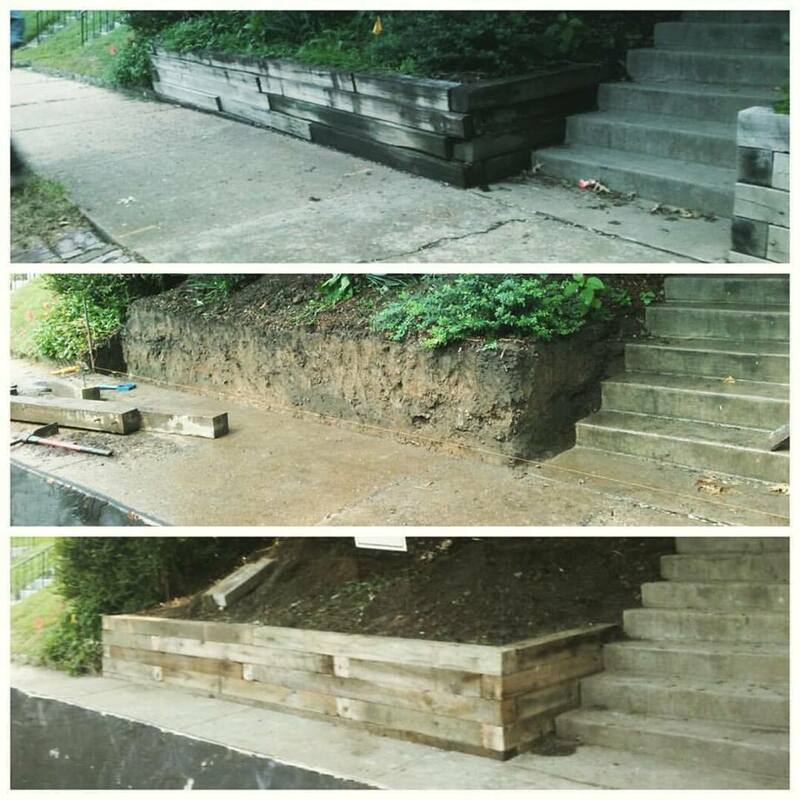 Maybe you'd like to reclaim more of that sloped land for a new patio, a pool, or to line the side of your driveway or front steps? 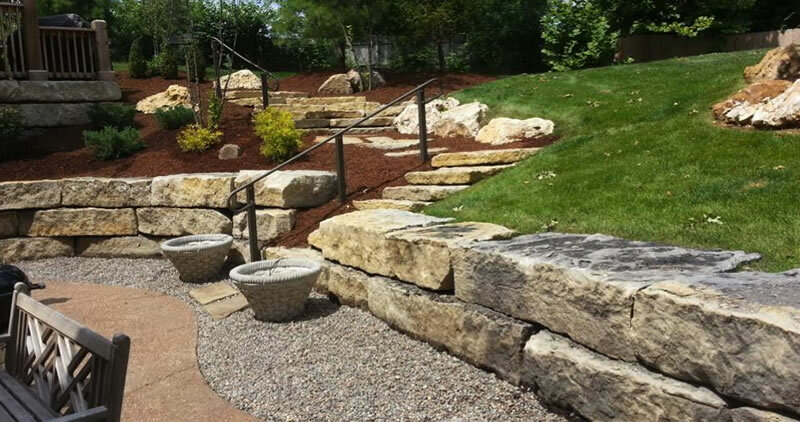 Retaining walls are a great way to enhance both the look and the function of your landscaping. 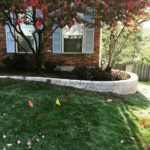 Irreco LLC is a full service landscaping contractor serving St. Louis, Missouri. 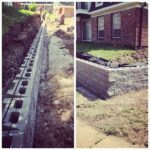 We specialize in the design and construction of retaining walls using brick, rock, block, and even concrete for both residential and commercial properties in need of a solution to use their sloped or uneven land. From a 40′ foot long stacked block retaining wall to hold back a terraced garden to large retaining walls to carve out more of your backyard on a sloping property. 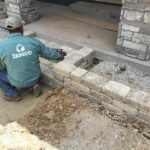 The team at Irreco will be able to provide a retaining wall solution that will benefit your specific property and meet your specific needs. 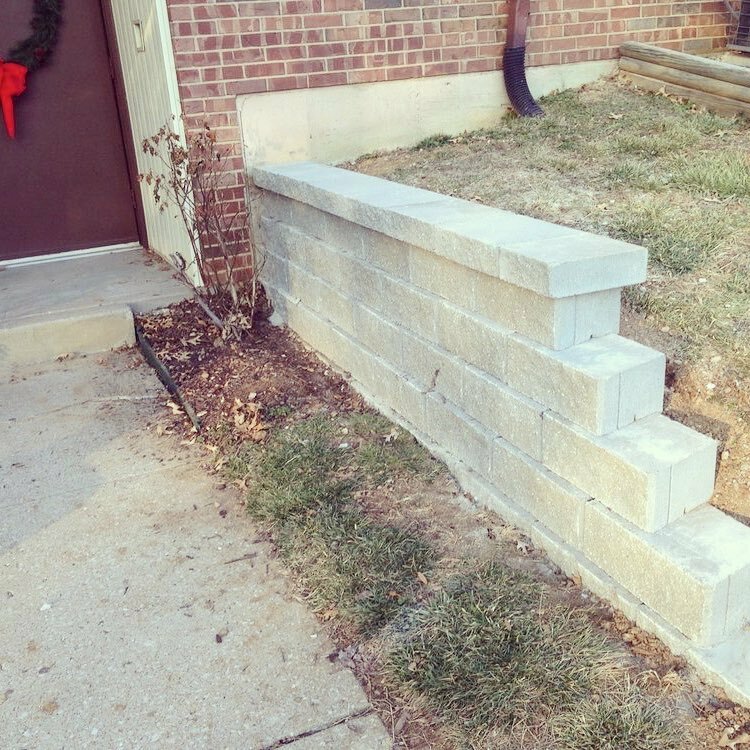 Do Retaining Walls Require Building Permits in St. Louis? The answer is some retaining walls do need building permits and some retaining walls don't! Clear as mud? Let us go into a little more detail and we'll explain what needs a permit and what doesn't. The retaining wall will exceed 3' (3 feet) in height. The wall exceeds 2’ (2 feet) in height and supports a surcharge load (driveway, pool, or similar structure). The wall is located less than or equal to its height from the property line. The wall has a fence or guardrail on top of the wall and the total height of the wall from the lowest grade to the top of the fence/guardrail exceeds 6’. If you are installing an "engineered" retaining wall (which we do install) then the designs are already pre-approved (up to 6' (6 feet) in height) but you still need to have a building permit for the project. Note: Retaining Walls (including walls that do not require a building permit) shall not block or affect an existing swale or drainage path in a manner to cause damming and ponding. The contracting municipality, if applicable, must always be contacted for zoning approval regardless of whether a building permit is required through St. Louis County Department of Public Works. These guidelines are taken directly from the St. Louis County Public Works Website: View The Complete Retaining Wall Requirements Here. While retaining walls are designed and built to hold back earth they will also hold back and channel water, this isn't a good thing as water and poor drainage is often the leading cause of retaining wall failure. 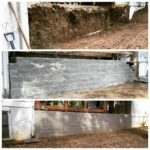 The water that builds up behind a retaining wall is referred to as “hydrostatic pressure” and the external force of the material/fill held behind your wall coupled with the weight of the water is often enough to seriously compromise the integrity of your wall and cause failure and collapse. 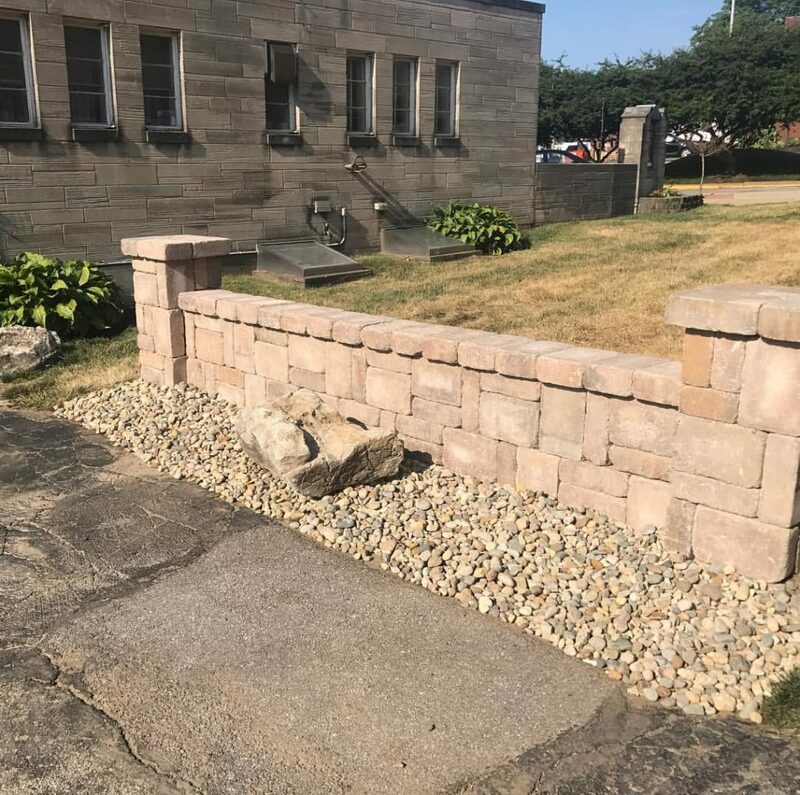 While many of the retaining wall projects we are called upon to complete are new retaining walls we are also called on quite a bit to repair, rebuild, or replace existing retaining walls that are collapsing, sagging, or failing in some way. 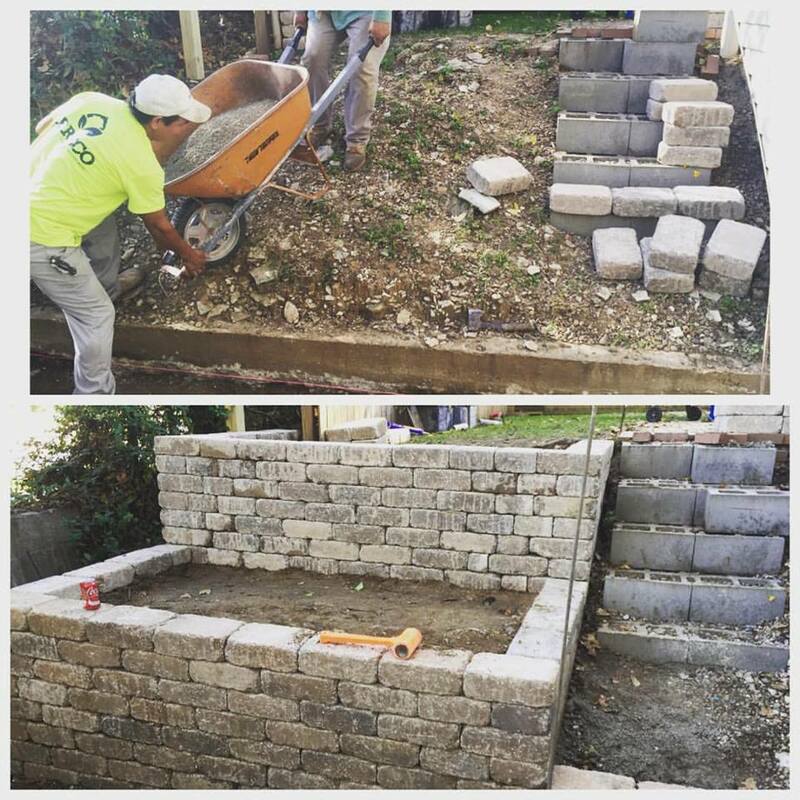 Whether it's tearing out an old wood retaining wall and replacing it with block, fixing drainage issues, or rebuilding a wall to handle a surcharge load our team can help you. There are many different materials to build your retaining wall from, we’ve just listed some of the more popular in our area because of their availability. 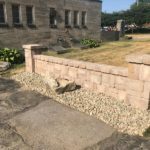 If you have an idea for a retaining wall and you don’t see the materials listed here please give us a call or use our contact form and we’d be happy to try and source them for you. 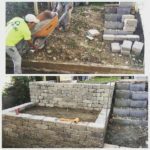 Landscaping Block Retaining Walls: This is probably one of the most common retaining wall materials because of it’s pleasing looks, availability and affordability. 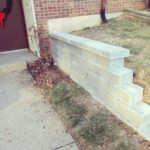 These retaining walls are usually also "engineered" meaning they are much easier to get approved for building permits. Landscaping blocks are usually used to build retaining walls that are under 6′ feet in height. They are available in different shapes with decorative colors and even texturing. They are however an excellent choice for retaining walls that are under 6 feet in height and more decorative in nature. There is a wide variety of fieldstone available locally and they can come in various shapes and sizes from round river rock style stones to very flat, flagstone type stones. 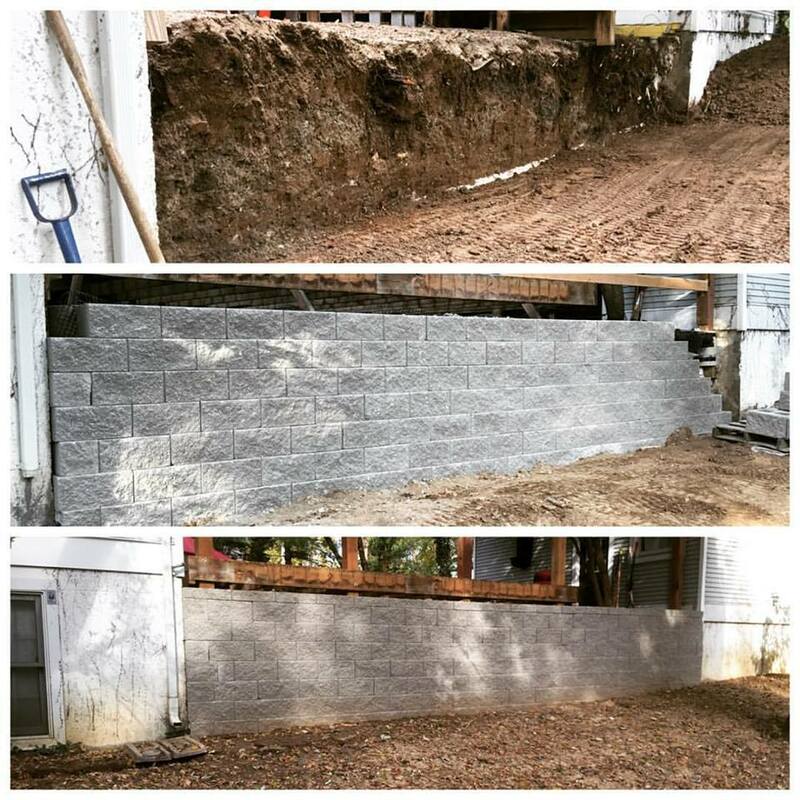 When building a retaining wall on your property that is designed to hold back tons of soil and earth there is very little margin for error so we work directly with geotechnical engineers if your wall is over 3 feet in height. The amount of work required to build a retaining wall can vary widely from project to project. 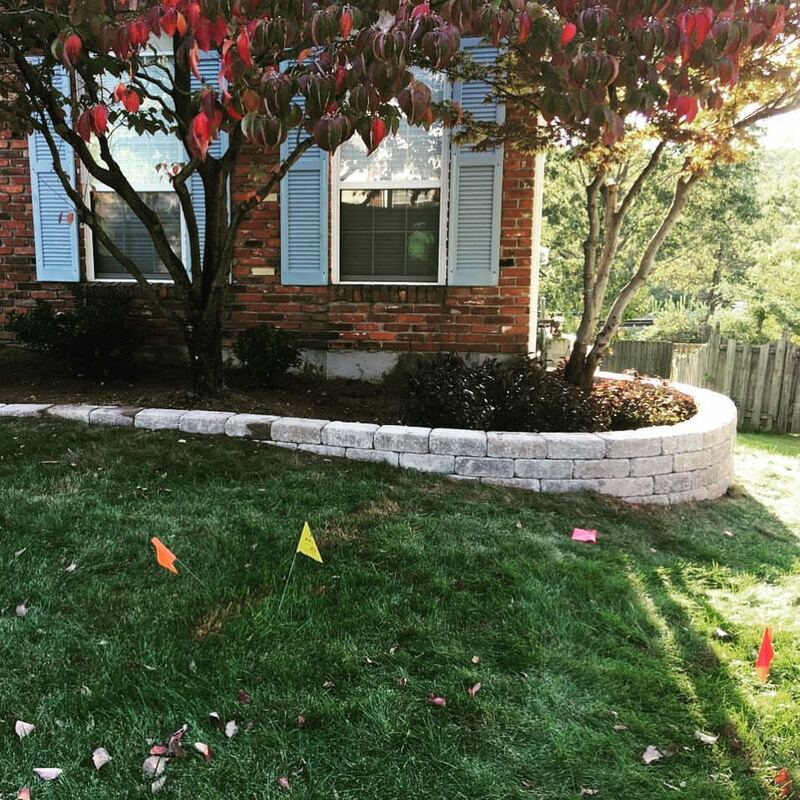 The slope of your property, the amount of earth your retaining wall must hold back, any surcharge load on top of the retaining wall, and the overall accessibility of your property will all contribute to the final cost. Why Choose Irreco For Retaining Wall Construction? We understand that you have many landscaping contractors to choose from throughout St. Louis. 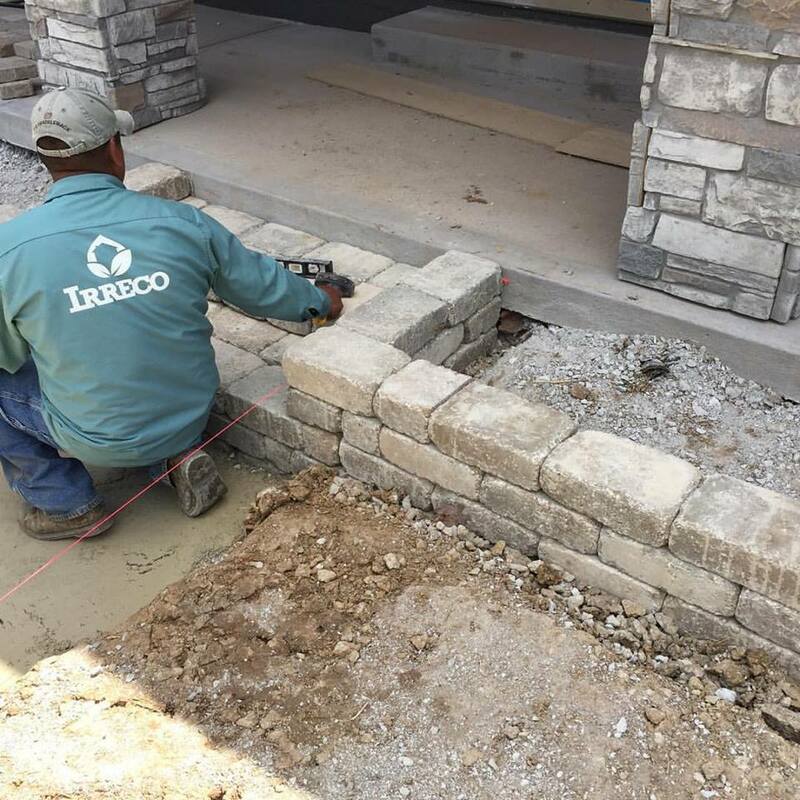 We just want you to know that when you choose to work with Irreco you are partnering with a small, locally owned business that has many years experience implementing retaining wall solutions into properties just like yours.